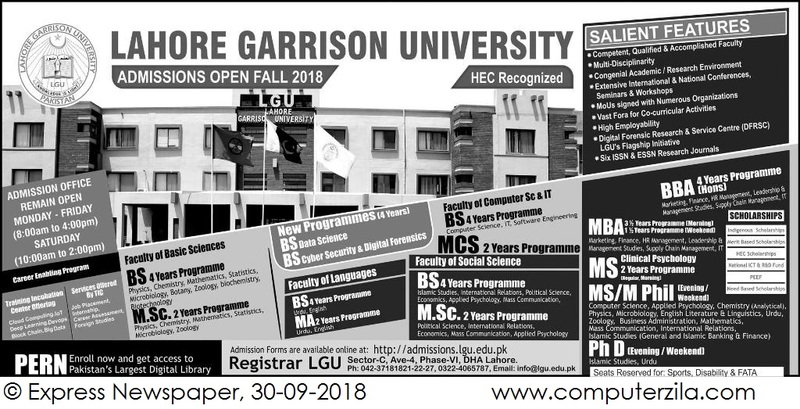 Admissions Open at Lahore Garrison Universit's Main Campus for the batch Fall 2018. LGU offers admissions in different fields of study for Bachelor, Master and PHD Programs. Lahore Garrison University Admission Open for Fall 2018 Offers Bachelors, Masters and PhD degree programs in the following fields. University DescriptionLahore Garrison University (Urdu: لاہور گیریژن یونیورسٹی‬‎) LGU is a private university situated in Lahore, Punjab, Pakistan. The university was established by the Pakistan army. It has two campuses in the townships of DHA and Lahore Cantonment. LGU runs undergraduates, graduates, Masters, M. Phil and PhD programs in various disciplines. University offers competent, qualified accomplished & multidisciplinary faculty. University is establishing Digital Forensics Research & Service Centre, it would be the first kind of digital forensics lab in Pakistan. LGU has signed MoUs with numerous organizations. More than 4000 students are studying in university along with 300 qualified staff and 18 departments. University is offering 25 professional courses. AP EAMCET application form will be released on 4th weeek of feb 2019. candidates must apply online for AP EAMCET Application Form 2019 through the official website of AP EAMCET 2019. Candidates who meets the eligibility criteria can set for the ap eamcet 2019 examination.